For example, one frequently cited study published in 2001 from Oregon State University, Trophic cascades among wolves, elk and aspen on Yellowstone National Park’s northern range, predicted that the presence of wolves would lead to a regeneration of the aspen trees in the Park. What, you might ask, have wolves got to do with trees? The answer goes like this: Aspen is kind of a weird tree, or more correctly, it is unusual because rather than reproducing through seeds it sends out suckers (root-like shoots) that pop up near the tree of origin and start a new tree. In a sense it makes clones of itself. A stand of aspen can be one tree, possibly hundreds of years old. Other plants do something like this — strawberries, for example — but it’s unusual for trees. Aspen is the dominant leafy tree at higher altitudes of the Rocky Mountain West, so the approach works. However, in Yellowstone the aspen population declined for decades from 4-6 percent of coverage in its natural area (the north range) during the 1940s and now down to less than 1 percent. Why was this happening: Climate change? Overgrazing? Disease? The possibility that this signaled a fundamental change in the ecology attracted biologists. The 2001 study, based on field studies and many other papers, came to the conclusion that overgrazing by elk was the primary cause of the aspen’s decline. Elk prefer the sprouts of young aspen trees and would also eat the bark of more mature trees, often “girdling” (eating a ring around the trunk) and weakening the tree. Too many elk, not enough aspen, and the aspen are unable to develop new growth – perhaps because of their rootedness to a location. The study tracked the expansion of the elk herd in northern Yellowstone and concluded that the eradication of their natural predator — wolves — was the ultimate reason for the elk overpopulation. No wolves, too many elk, the aspen trees decline. The prediction of the study followed the logic that the re-introduction of wolves would sooner or later make a substantial reduction in the elk herd. In turn, the elk would become less likely to feed in the open areas where aspen grow for fear of being attacked by wolves. Both factors (fewer elk, fear of wolves) would mean less eating of aspen. The aspen would be able to recover. In turn, this would lead to what biologists call a trophic cascade; one change in the ecology would allow many animals, insects, and birds to return to the restored aspen tree environment — the beaver being a prominent example. Fifteen years later and much more data about the Yellowstone environment, wolves and elk in particular, and the prediction does not appear to hold up. A new study by Matthew Kauffman (USGS), Jedediah Brodie (University of Montana) and Erik Jules (Humboldt State University) published online in the Ecological Society of America journal Ecology (Are wolves saving Yellowstone’s aspen? A landscape-level test of a behaviorally mediated trophic cascade) find that the elk don’t seem to recognize the “landscape of fear” that would keep them from browsing on vulnerable aspen. Our study demonstrates that the historical failure of aspen to regenerate varied widely among stands (last recruitment year ranged from 1892 to 1956), and our data do not indicate an abrupt cessation of recruitment. This pattern of recruitment failure appears more consistent with a gradual increase in elk numbers rather than a rapid behavioral shift in elk foraging following wolf extirpation. In addition, our estimates of relative survivorship of young browsable aspen indicate that aspen are not currently recovering in Yellowstone, even in the presence of a large wolf population. In short, the elk didn’t change their eating habits because of the big bad wolves. Elk, bison and other herbivores go where the food is — not where the wolves aren’t. From the elk’s perspective, so to speak, a wolf pack can show up most anywhere. What’s important for the elk is food (first), reproduction (in season), and wolves (if and when they show up). In this hierarchy of priorities, moving to where food is located is primary and continuous. Avoiding wolves is secondary (or tertiary) and a matter of specific instances. That’s why the elk continue to feed on aspen as the herds move around northern Yellowstone. In the longer run, perhaps the wolves will contribute to reducing elk herd to a level where the aspen can recover; but it won’t be because the elk modify their foraging in fear of the wolves. 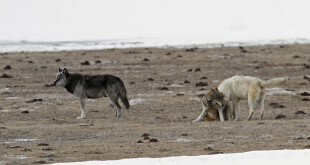 The new study calls into question some of the notions about a trophic cascade — especially the one presumably caused by wolves. It suggests that ecological changes are often more subtle than humans imagine. It’s not that the earlier studies are a mistake; they are merely mistaken. This is normal science, but it does make it difficult for people who make animal management policy in Yellowstone Park.–Nelson King. Contributing editor King’s SciTechStory site tracks the impact of science and technology. Want to Get Away from it All in Yellowstone? Take a Hike!